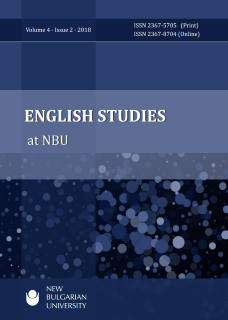 English Studies at NBU (ESNBU) is an entirely open access, double-blind peer reviewed academic journal published by the Department of English Studies, New Bulgarian University in two issues per year, June and December, in print and online. Manuscripts are accepted in English. Translations of published articles are not accepted. ESNBU is Open Access - all published articles are freely available without charge to the users or their institutions. Users are allowed to read, download, copy, distribute, print, search, or link to the full texts of the articles, or use them for any other lawful purpose, without asking prior permission from the publisher or the author as long as the original authors, citation details and publisher are identified. This is in accordance with the definition of open access of the Budapest Open Access Initiative (BOAI). ESNBU was invited to share the experience of establishing itself as an exemplar academic publication of NBU! All rejoice at such a recognition for a boutique journal! Which journal should I publish in? Why has my manuscript been rejected? These and other questions can be daunting to both new and experienced researchers. Here's some good advice from interpretive (consumer) research on how to get your manuscripts accepted. by Eileen Fischer, Ahir Gopaldas, Daiane Scaraboto Qualitative Market Research: An International Journal Vol.20, No.1, 2017, pp.60-67 DOI 10.1108/QMR-06-2016-0051 In short 1. Clearly indicate which theoretical conversation your paper is joining. Do so as early as possible in the paper. 2. Join a theoretical conversation that belongs in your target journal. Alternatively, target a journal that cares about the conversation that you are joining. 3. Conclude your review of the theoretical conversation with gaps, problems and ideally specific research questions that your study will address. 4. Collect the data that you need to answer your research questions. Alternatively, only ask research questions that your data can answer. 5. Build your descriptive observations about contexts into theoretical claims about concepts. 6. Explain both how things are and why things are the way that they are. 7. Illustrate your theoretical claims with data and support them with theoretical argumentation. 8. Advance the theoretical conversation in a novel and radical way. In other words, offer readers something “new” and “big”.